The visit of senior officials from UNDP, Kathmandu including Mr. Renaud Meyer, Country Director UNDP, Kathmandu, Mr. Gopal Raj Sherchan, National Coordinator, UNDP GEF Small Grants Programme (SGP) to observe UNDP GEF SGP assisted agroforestry project in Rabang, Raksirang and Carp-SIS Aquaculture project in Handikhola on 8 Nov 2017. 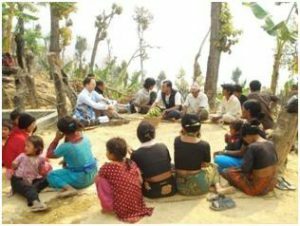 The key message from the UNDP Country Director as reflected in the news detail of Mr. Shiva Kumar Kashi (Environmental Journalist), we got that ‘We all worked together to build our nation (i.e France)’ in a query of Kanchhi Maya Didi from Rabang community. Let’s take this key message and work together further to build our community and nation. Many thanks to Ek Raj Upreti Ji , Municipal Chief for being together with the team and deliver our key messages of UNDP’s assistance in Makawanpur. Thanks also to all community members for their sincere presence with high delegates. 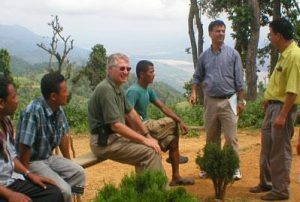 Thanks, Mr. Meyer and Gopal Sir for your time to visit our project area in Makawanpur. 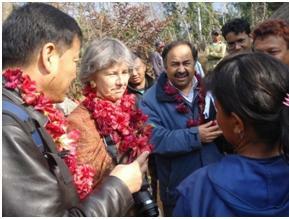 Honorable Danish ambassador to Nepal Mr. Finnthilsted visited the project on July 18, 2006. 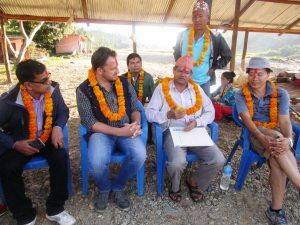 He visited Rupachuri village of Manahari VDC-2 and Rajaiya of Manahari-8 and observed different project activities supported by Danish assistance. He was accompanied by Mr. Shiva S. Paudyal, Senior Peoramme Officer of the Embassy. uri and Nigeuretar village in Raksirang VDC-8 on 16,January 2010 and discussed with the community members on various activities intended to improve khoriya farming. 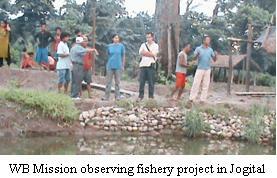 The team led by Dr. Federico Lopez Casero, Policy Researcher, Forest Conservation, Livelihoods and Rights Project, IGES, Japan and Dr. Ukesh Raj Bhuju, Conservation Consultant, Kathmandu visited different project sites supported by UNDP GEF Small Grants Programme in connection with the monitoring of Ryutaro Hashimoto APFED Award 2008. 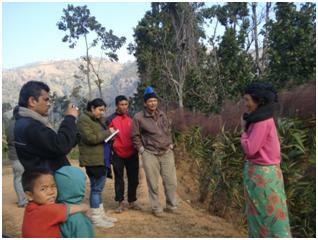 Journalist representing from from Republica Ms. Bidushi Dhungel & Annapurna Post Daily Mr. Rabin Giri observing slope land and rural road activities supported jointly by World Food Programme and UNDP GEF Small Grants Programme in Agra, Gogane & Raksirang VDC respectively. development activities supported by Poverty Alleviation Fund (PAF) and World Food Programme (WFP). 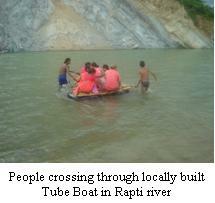 The team spent two days from August 26 to 27, 2009 in Makawanpur. On August 26, the team visited Agra and Gogane VDC and observed rural road in Dumsikharka and Dandabas area (located in some 1900 m altitude) supported by PAF & WFP/RCIW respectively under financial assistance of the World Bank. Ms. Acharya and her team members Mr. Tash Tenzing, Sr. Environmental Engineer and Ms. Patience Mensah, Consultant were very much impressed with the commercial vegetable farming grown around these road corridors and realized the benefits of road in poverty eradication programme. Ms. Acharya marked that this is the pioneering shift from the conventional model of income generating activities and could be learned as lessons in poverty reduction programme for such a hilly country Nepal. 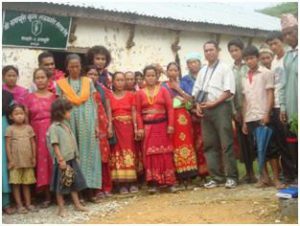 User’s Committee chair Mr. Bel Bahadur Moktan of Dumsikharka village where the road is recently connected with PAF support submitted the list of recent incomes worth of Rs. 2.8 million from sales of vegetables collected from Dumsikharka community. Due to incessant rain at that time, the team could not be able to meet large audiences awaiting them in Dumsikharka. However, they took information from beneficiaries around over the impacts of the projects. On second day, the team visited Manahari and Handikhola VDC and observed some small scale fisheries projects in Jogital and Sunachuri village in Manahari VDC established by some women farmers. Unfortunately, due to floods in Rapti river again the team could not observe hybridized drinking water and gravity irrigation system in Handikhola located just across of the Rapti river. They discussed with some beneficiaries including Mr. Palsang Rumba, Chairperson of the User’s Committee who met the team by crossing river on locally built tube boat. The team was accompanied by Mr. Nirmal Pant, Om Poudel, Portfolio Managers from PAF and Mr. Khop Narayan Shrestha and his team members Mr, Dhruba Shrestha (Engineer), Mr, Top Bahadur Sahi, Navin Subedi, Mr. Ram Krishna Praja, and Mr. Rajan Bhandari from MDI.